Rail travel in the U.K. has both a good and a bad reputation. It can be speedy and convenient, and better for the environment than going in a car. But the booking system can be confusing, tickets can be expensive, and you have to hope there are no delays. There are about 30 different rail companies in the U.K., and each has its own charter, with promises and rights. However, there are certain rights that cover them all to protect you and your journey. You're only entitled to a seat on your train if you've made a reservation in advance. You can do that at the point of purchase (i.e. ticket office or machine) or later if you produce your ticket (there may be a charge for this service but that's not normally the case). If you don't have a reservation the train company can't guarantee that there'll be a seat available on your journey and you're unlikely to receive compensation if you have to stand. But if your seat or sleeper reservation isn't honoured, the train company on whose train you intended to travel will refund any reservation fee you've paid. If you reserve a seat and have to stand for all or part of your journey, the train company should also compensate you for your inconvenience. Under the Disability Discrimination Act, 1995, you can take a standard sized "reference" wheelchair on all trains. In fact, many trains have spaces to accommodate wheelchairs. However, it's recommended you contact the company at least 24 hours before you travel. They can provide information on station and train facilities and arrange additional assistance for your journey if required. If the train has dedicated spaces for wheelchairs and these are full, you'll have to travel by another train if you haven't reserved one of them. If your train is cancelled, delayed or you don't get your reserved seat and you decide not to travel, you can take your ticket to the ticket office where you purchased it for an immediate refund. You also have the option of taking your ticket to any ticket office within 28 days, but the refund may not be immediate. You should not have any administration charge deducted from your refund. If your train is delayed for more than an hour by circumstances controllable by the train company you're entitled to compensation in the form of travel vouchers. Many train companies actually offer compensation even if you have been delayed for less than an hour. If a cancellation or delay within the train company's control leaves you stranded at a station, the company should help you by providing alternative transport to your destination or a convenient station, or overnight accommodation. Your luggage is your own responsibility, and train companies aren't liable for compensation because of lost or damaged luggage unless it was caused by the neglect of the company or its staff. If you have a complaint about your rail service or journey, the first step is to contact the company that operates the line, train or station in question. Speak to a staff member on the train, or at the station. If you need to take your complaint further, put it in writing, including proof of your journey (keep a photocopy of all documentation you send and proof of posting - send by recorded delivery). If the train operator's response doesn't satisfy you, ask Passenger Focus to follow it up. They'll review your complaint. If they feel the rail company should have done more, they can make a representation on your behalf. Again, put everything in writing and send them all previous correspondence and evidence. If your complaint involves an injury received while onboard a train or at a station, contact someone connected with the train or station immediately. Some years ago my partner and I were unable to stand in the 2nd class carriage due to the train being full but there were seats in the 1st class section. My partner informed me we could sit in these seats that were spare not reserved she asked the ticket inspector and he said we could but dont tell everyone - is this still the case? You don't mention the compensation rules for season ticket holders. 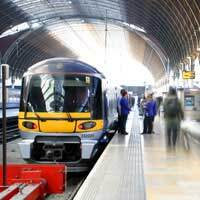 For instance if you have a season ticket for a First Great Western route, you will only get compensation if you renew your ticket and only then is their service measures for punctuality and reliability are not met. So under FGW's passenger charter if you don't renew your season ticket you will not receive any compensation whatsoever. These seem to be unfair contract terms - do you have any views? FGW have announced that they are giving up their franchise in 2012 - for "commercial reasons" - but will be reapplying for the new franchise that results.I would hope that FGW's terms and conditions are highlighted.